Two Italian-made angels watch over the Gibbes Mound. Gibbes Mound: Here lies James Shoolbred Gibbes—whose donation of $100,000 led to the Gibbes Museum of Art—along with his seven relatives. Before his 1888 death (when he was estimated to be worth more than a million dollars), he had angels sculpted in Italy for his mausoleum, the only one in Magnolia with an earthen mound raised over top. Raymond-White Plot: Of Blake and Rosalie White’s eight children, five didn’t survive youth. 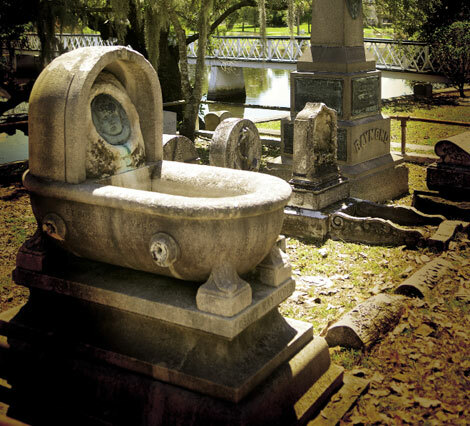 A haunting reminder of childhood death’s role in the Victorian era, their family plot includes Rosalie Raymond, immortalized in a portrait atop her stone cradle. The Soldiers’ Ground includes 82 S.C. men who died at Gettysburg. Soldiers’ Ground: A bronze soldier marching northward overlooks markers (made of stone leftover from the Columbia, S.C., capitol building) for more than 850 Confederate servicemen. Mausoleum Row: Each of the Vanderhorst, Wilkes, MacDowell/Wragg, and White mausoleums are fascinatingly grand, yet the last is deteriorated enough to offer a glimpse into its 16- to 18-foot crypt, where stone shelves for coffins sit empty, the family’s remains having been reinterred elsewhere. Hunley Circle: Three crews of mariners who perished aboard the H.L. 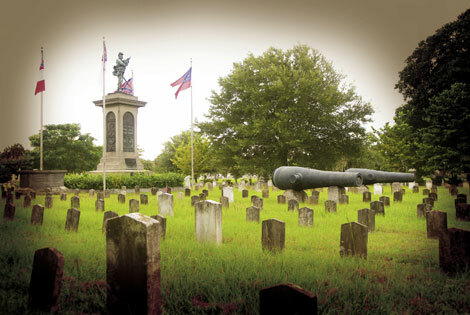 Hunley are buried here. The submarine’s second crew was laid to rest following the ill-fated mission in 1863, the first in 2000 after being found beneath Johnson Hagood Stadium, and the third in 2004 following their discovery on the ocean floor. Receiving Tomb: The sole structure left from the 1851 plan for Magnolia was designed by local architects Edward C. Jones and Francis D. Lee for holding the dead for days to months while a tomb or crypt was finished. It’s no longer in use. 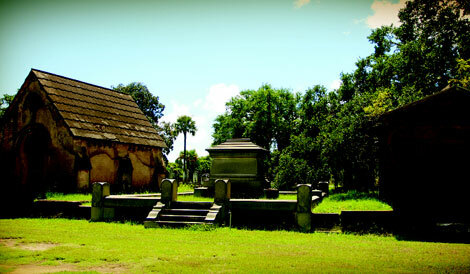 Tour de Graves: On Friday, October 25, walking tours are from 4-7 p.m. at Magnolia Cemetery, 70 Cunnington Ave. Buy tickets supporting Historic Charleston Foundation ($20; $10 Friends & Young Advocates of HCF) at www.historiccharleston.org.